Price and Volume Trend (PVT) is a variation of On Balance Volume, used to determine the strength of trends and warn of reversals. 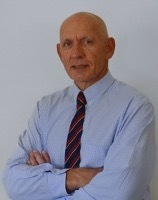 Colin Twiggs' free weekly review of the global economy will help you identify market risk and improve your timing. Trading signals are the same as for OBV and Accumulation Distribution. Price and Volume Trend should not be used on its own but in conjunction with other indicators. During a ranging market watch for a rising or falling Price and Volume Trend. Rising PVT signals an upward breakout. Falling PVT signals a downward breakout. A rising Price and Volume Trend confirms an up-trend and a falling PVT confirms a down-trend. Bullish divergence between PVT and price warns of market bottoms. Bearish divergence between PVT and price warns of market tops. 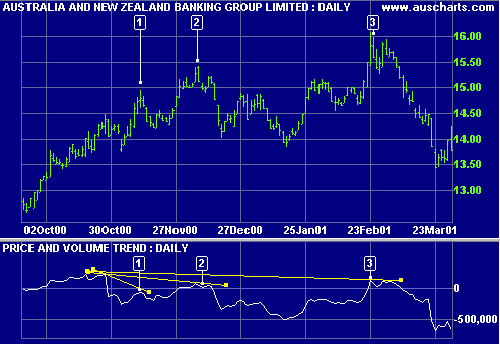 Australia and New Zealand Banking Group Limited (ANZ) is shown with Price Volume Trend. After a strong up-trend there is a bearish divergence with price making a new high and Price and Volume Trend making a lower high. This is followed by a triple divergence: price makes a higher peak while PVT is lower. Price makes another new high at the end of February while PVT again fails to make a new high. Note the classic divergence. See Indicator Panel for directions on how to set up Price and Volume Trend. Edit Indicator Settings to alter the default settings.